The Lascaux Shaft Scene. At left is the main panel on the main wall with the rhino, duck/goose and disembowelled aurochs/bison, with a dying man. At right is the horse on rear wall. Photos: Coombs et al. A lion may be the star sign we associate with the constellation Leo, but ancients may well have represented this star group with the horse many thousands of years ago. Some of the world’s paleolithic and neolithic art featuring horses and other depictions of wild animals have come under fresh scrutiny by researchers, who suggest they show a relatively advanced knowledge of astronomy. 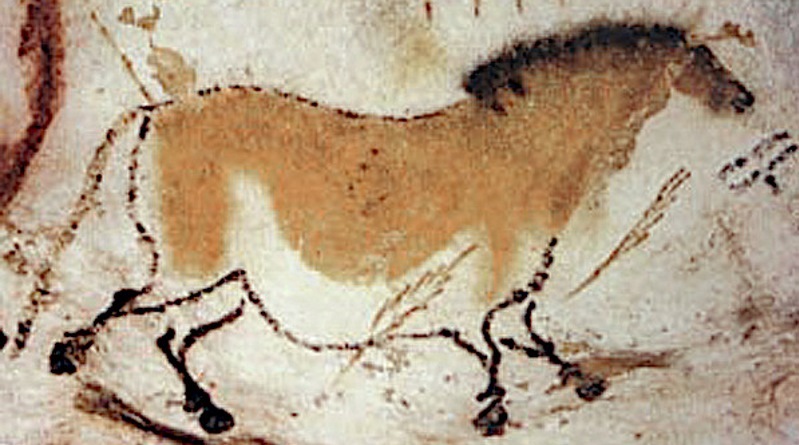 The artworks, at sites across Europe, are not simply depictions of wild animals, such as horses, as was previously thought. Instead, the animal symbols represent star constellations in the night sky, and were used to represent dates and mark events such as comet strikes, analysis suggests. The work reveals that, perhaps as far back as 40,000 years ago, humans kept track of time using knowledge of how the position of the stars slowly changed over thousands of years. The findings, published in the Athens Journal of History, suggest that ancient people understood an effect caused by the gradual shift of Earth’s rotational axis. Discovery of this phenomenon, called precession of the equinoxes, was previously credited to the ancient Greeks. The researchers’ work included a fascinating analysis and interpretation of the famous Lascaux cave paintings in France, revealed to the modern world in the 1940s after being found by a group of teenagers. The researchers say a horse pictured alone on one wall is central to the interpretation of an important cluster of images. Up to 600 images, some up to 17,000 years old, are pictured on the walls, including horses and aurochs. The researchers concentrated on a group of images known as the Shaft Scene. It is quite separate from all the other artwork at Lascaux, being at the bottom of a deep shaft, suggesting it had special status. It is also unique among Palaeolithic artworks in that it depicts a man, apparently falling in a manner suggesting injury or death. Only four different animal symbols are displayed here; a bison/aurochs, duck/goose, and rhinoceros (to the left of the falling/dying man) on the main wall with a horse on the rear wall. “The bison is particularly striking, apparently pierced by a spear. It also seems to be dying, given its entrails are hanging underneath. They said the Shaft Scene shows striking similarities with Göbekli Tepe’s Vulture Stone, a stone carved in relief in eastern Turkey, which raised the question whether it could be interpreted the same way. At Göbekli Tepe, the four animals depicted correspond to the four solstices and equinoxes at the date of the mini ice age known as the Younger Dryas event, around 11,000 BC. The stone is interpreted as a memorial to a devastating comet strike which was thought to have initiated the Younger Dryas period. The researchers concluded that the Shaft Scene images represent a possible comet strike about 15,150 BC, plus or minus 200 years, most likely part of an encounter with the Taurid meteor stream. They found that the rhinoceros represents Taurus and the horse likely represents Leo. The researchers found a series of striking links between the depictions of animals in cave art across Europe, and star constellations. The findings indicate that the astronomical insights of ancient people were far greater than previously believed. Their knowledge may have aided navigation of the open seas, with implications for our understanding of prehistoric human migration. The researchers from the Universities of Edinburgh and Kent studied details of Palaeolithic and Neolithic art featuring animal symbols at sites in Turkey, Spain, France and Germany. “These findings support a theory of multiple comet impacts over the course of human development, and will probably revolutionise how prehistoric populations are seen,” Sweatman said. B. Sweatman, Martin & Coombs, Alistair. (2018). Decoding European Palaeolithic art: Extremely ancient knowledge of precession of the equinoxes.